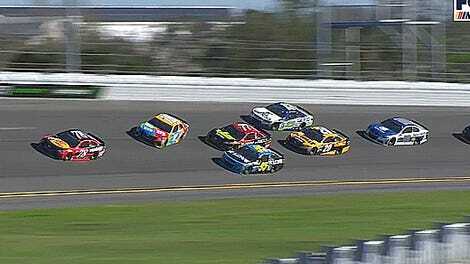 Here’s what happens when NASCAR’s Cup Series tries to go four-wide at Daytona where there’s only space for three cars abreast: one huge crash. Jamie McMurray got a good run coming out of Turn 2 in the No. 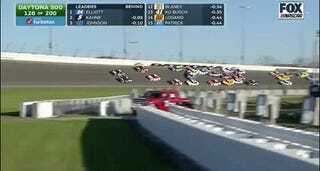 1 car, going for the gap above Jimmie Johnson’s No. 48 car. Problem is, there just wasn’t room for cars to go four-wide going into Turn 3, and the second “big one” happened. Fortunately, no one was injured in the pile-up. Shortly afterwards, another crash happened between when Jeffrey Earnhardt ran into the back of Elliott Sadler as Sadler and Trevor Bayne were both signaling that they were about to pull into the pit lane, reports Fox Sports. 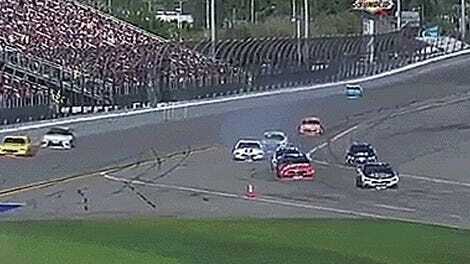 Trevor Bayne and Ricky Stenhouse Jr. also got caught up in the chain reaction that ensued. Who’s actually going to be left at the end of this race? Are we about to see an upset?